This is the most visited building in Australia, where one can see Australian politics in action. Situated in the heart of the capital, the building is widely-known for its breathtaking architecture, beautiful gardens and collection of Australian modern art. The symbol of Canberra is the 81 metre flag above the building. The Parliament is open to visitors at any time and they can even watch and listen while the deputies discuss and make decisions. There are available guided tours every 30 minutes plus brochures and audio-guides in many languages. You can also admire the Parliamentary Triangle and Lake Burley Griffin from the Queen's Terrace Café. This famous building used to be home to Australia's Federal Parliament from 1927 to 1988 and is the place where Australia grew up. Nowadays, this admired heritage building enables tourists to take a glimpse into Australia's fascinating past. The Old Parliament House is full of stories from Australia's political past. There is an exciting program of guided tours, exhibitions and other activities. What is more it is now the home of the Australia's National Portrait Gallery. This place was created in honour of the sacrifice of Australian men and women who have served in war. Its exhibitions represent stories of Australians at war, in armed fights and while peacekeeping. The Memorial was opened in 1941 and due to its ceremonial areas, huge exhibitions and research facilities has become an inseparable part of Canberra. In the Memorial are presented relics, artworks, photographs and personal items. 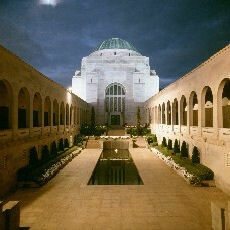 There also is Hall of Memory, the Tomb of the Unknown Australian Soldier and the Roll of Honour which lists 102,000 Australian men and women who have died in war. This is the most important art building in Australia and it houses more than 100,000 works of art and world-class art exhibitions. People of all cultures and ages are attracted to this place by virtue of the permanent display and travelling exhibitions program. The exhibitions in the Gallery feature works of art from four main areas: Australian, Aboriginal and Torres Strait Islander, Asian and international art. The works of art there are a national possession and belong to the Australian people. 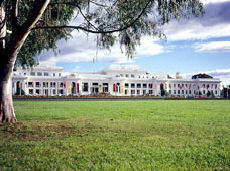 This building is the residence of Australian Prime Ministers since 1927. It is open for the public only in some days of the year. This building is situated by the lake and has a seven storey high public hall and fascinating waterfall. The High Court has 3 courtrooms and a breathtaking public hall decorated with murals representing the growth of the Australian country. The main function of the High Court is to interpret the Constitution and it is open for public visitors. The largest library in Australia has 220 kilometres of shelvs. Visitors can see where the books, manuscripts, newspapers, maps and paintings are situated, relax in the café or admire the views of the lake. Just 45 minutes away from the capital there are two great outdoor areas – Tidbinbilla Nature Reserve and Namadgi National Park. There you can look around on foot and admire the special animals and plants, typical only for Australia. In the Namadgi National Park you can see Aboriginal shelters and also even camp there. One can also visit the Heritage Gallery, All Saints Church, the Black Mountain, Canberra Nature Park, Kingston, Changi Chapel and many more.